America's elderly population is soaring, presenting numerous challenges for policymakers in the United States. Other developed nations with aging populations face similar problems. There will be fewer workers relative to retirees in coming decades and the elderly are also expected to live longer. The impact of these demographic changes in the United States is likely to be challenging, especially for America's system of social security. Solomon offers new perspectives on how to meet the future costs of social security without bankrupting the next generation or gravely damaging the U.S. economy. He also shows, more broadly, how to provide for the financial security of America's senior populations. Over the past two decades, primary responsibility for providing a financially adequate retirement has shifted from the federal government and employers to individuals. For most Americans, social security alone will not provide enough income. Most companies have shed their pension plans for 401(k) plans, to which companies and employees contribute, and in which participants must make their own investment decisions. Consequently, achieving financial security in retirement has increasingly become one's personal responsibility. Solomon deals extensively with the politics of social security, past and present. He examines the presidential leadership of Franklin D. Roosevelt and Ronald Reagan, both of whom revived the nation's spirit in times of crisis, both of whom introduced economic policies that remain controversial to the present day. He also considers in detail contemporary efforts to rethink social security, focusing on fundamental reform of the social security system and the expansion and simplification of employer-sponsored retirement plans and individual retirement arrangements. 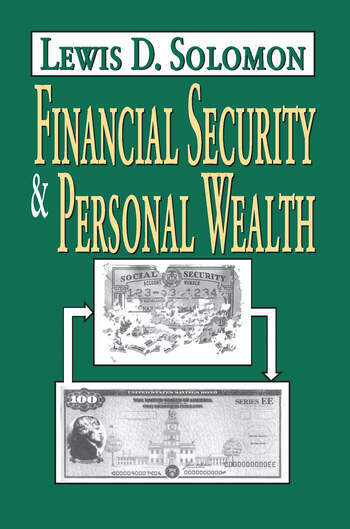 Richly textured, informed, and informative, Financial Security and Personal Wealth encompasses history, demography, political economy, public finance, social policy. It will be of interest to policymakers, economists, and political scientists in the United States and elsewhere.